The eight American troops killed by an Afghan pilot earlier this week at an airport in Kabul were all armed with "weapons and ammo," according to the preliminary findings released Friday of an investigation by NATO and the Afghan government. The NATO-led International Security Assistance Force in Afghanistan has said the military pilot opened fire on the troops, sparking a gunfight on Wednesday. 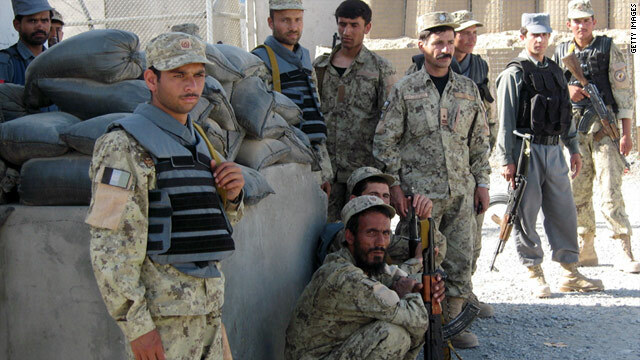 The investigation centers around how the gunman managed to kill eight armed troops, an ISAF official briefed on the investigation told CNN. A private American contractor was also killed in the shooting. The military says gains made in Afghanistan over the last half year has created the "necessary conditions" to begin transferring control of security to the Afghanistan government in seven areas of the country inhabited by approximately 20-25% of the population, according to a new report prepared by the Pentagon for Congress. The latest semi-annual report concludes insurgent momentum has been halted in much of the country though the gains are "fragile and reversible." However, the report notes that efforts to fortify government and development was "slower than security gains" over the the last six months. Sometimes the United States enters places in South Asia and we assume it is all very simple – there are good guys and bad guys. We are coming in support the good guys, so we presume they should be on our side against the bad guys. But actually there is an existing set of regional dynamics at work. We’re the interloper. We’re coming into this game pretty late. The regional actors think we are going to leave. 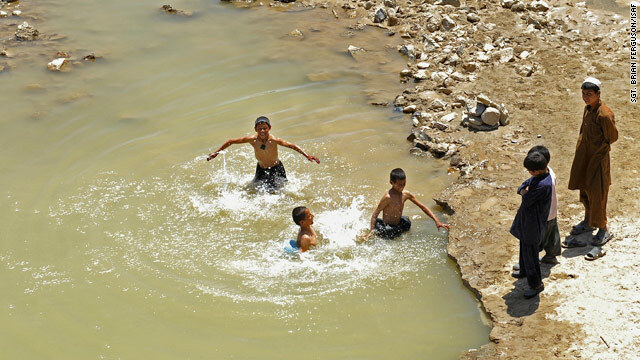 As summer peeks around the corner and warmer weather appears, children splash and play to cool off in the Tarnek River in the Zabul province located in southern Afghanistan. Petraeus took over the command in Afghanistan in summer 2010 after Gen. Stanley McChrystal was relieved of his duties. McChrystal and his staff were quoted in a Rolling Stone magazine article criticizing and mocking key administration officials. Petraeus took the highly unusual step of publicly acknowledging that he might be in contention for a presidential appointment. "It's probably not appropriate for me to comment on whatever might be considered down the road," he told reporters in Kabul this month when asked about the possible CIA nomination. "I've had discussions, but again, it wouldn't be appropriate to comment." Kabul, Afghanistan (CNN) - At least six American service members were killed Wednesday when a man opened fire on troops and a "gunfight" ensued at an airport in the Afghan capital, military officials said. A NATO official backed off earlier reports that eight coalition service members and a contractor were killed, saying that the alliance could only confirm six International Security Assistance Force (ISAF) troops were killed. It did not disclose their nationalities. The incident - which occurred at the Afghan national air force compound at North Kabul International Airport - stems from an argument between an Afghan pilot and an international colleague, officials said. WikiLeaks' latest release is classified military documents that detail information obtained from Guantanamo detainees. What do they reveal about Osama bin Laden and al Qaeda? I think we have a little bit better sense of where he was in the immediate aftermath of 9/11. I think overall, these WikiLeaks documents about Guantanamo remind me a little bit of the WikiLeaks documents we had about Afghanistan and Pakistan from the U.S. military. They don't really add anything seismic to our general understanding of what happened. They're filling in details. They will be very interesting for future historians. These are not top-secret documents. They're secret. So they're not the crown jewels. The fact that bin Laden was hard up for cash I think is pretty interesting, but that sort of accords with something we already knew, that bin Laden didn't have millions of dollars when he was in Afghanistan. Even though he's the son of a billionaire, money was tight during this time period. It's interesting now we have confirmation that the operational commander of 9/11, Khalid Sheikh Mohammed, was watching these events unfold live on TV in Karachi, Pakistan. But again I think that's something, if we didn't know for a fact, we certainly probably thought was true already.